An independent variable is an input, assumption, or driver that is changed in order to assess its impact on a dependent variable (the outcome). Think of the independent variable as the input and the dependent variable as the output. In financial modelingWhat is Financial ModelingFinancial modeling is performed in Excel to forecast a company's financial performance. Overview of what is financial modeling, how & why to build a model. A 3 statement model links income statement, balance sheet, and cash flow statement. More advanced types of financial models are built for valuation, plannnig, and and analysis, an analyst typically performs sensitivity analysisWhat is Sensitivity Analysis?Sensitivity Analysis is a tool used in financial modeling to analyze how the different values for a set of independent variables affect a dependent variable under certain specific conditions. Sensitivity Analysis is performed in Excel to asses risks, measure potential outcomes, and plan for an uncertain future in Excel, which involves changing assumptions in the model to observe the impact on an output. 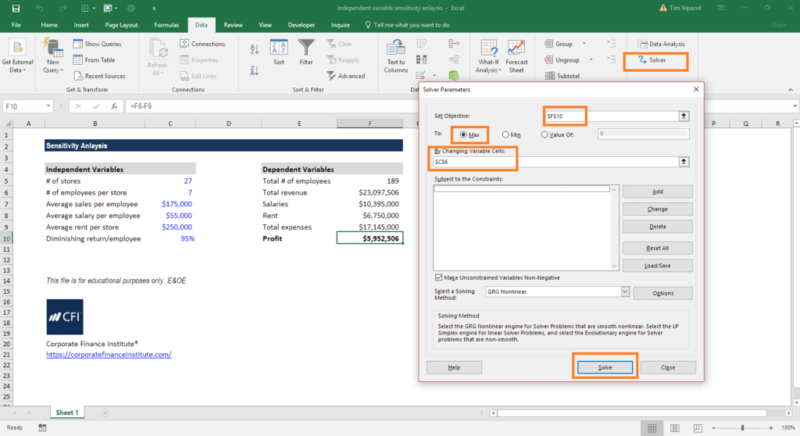 When building an Excel model3 Statement ModelA 3 statement model links the income statement, balance sheet, and cash flow statement into one dynamically connected financial model. 3 statement models are the foundation for advanced financial models such as DCF models, merger models, LBO models, and others. This three statement model guide has examples, images, the analyst needs to think carefully about how to set up an independent variable in the assumptions section. They are the inputs that will drive the model and resulting outputs. One of the best ways to select assumptions is to perform a root-cause analysis. For example, what causes revenue to fluctuate? Volume and price. What causes the volume to change? The number of products offered and the number of stores. The process continues until the analyst identifies all independent variables that will be used to drive the model. Once the variables have been determined and set up in Excel, the next task is to create formulas and functions that determine the outputs. For example, the number of stores times the number of products sold per store times the average price per product equals total revenue. After the function has been created, the dependent variable, revenue, will be impacted by changes in any of the underlying assumptions and drivers. At this point, some tests should be performed to ensure the linking is properly set up and the dependent variable changes as expected with the changes in the assumptions. Once the model has been built, it’s time to start changing the assumptions and driver to see their impact on the depending variable, and test hypotheses, run scenariosScenario AnalysisScenario analysis is a technique used to analyze decisions through speculating various possible outcomes in financial investments. In financial modeling, this process is typically used to estimate changes in the value of a business or cash flow. By using the Choose or Offset functions an analyst can crease base case and measure sensitivity. For example, the analyst may begin to manually change each assumption and record the change in the dependent variable (in this case, revenue). Another option is to create data tables in Excel that can record the numbers automatically and store them conveniently in a neat table. Finally, the analyst may run discrete scenarios where a series of changes are made to assumptions with a story tied to them (for example, the company’s “optimistic case” scenario where everything goes well). Let’s look at an example of how to set up a model that can change an independent variable to test a hypothesis and measure sensitivity to changes. In this simple model we created, you can see the effect of changing a variable. The question an analyst would ask is, given all the assumptions, what is the optimal number of employees per store that this company should operate with? We know that employees generate an average of $175,000 each, but that there is a diminishing return of 5% to the power of the number of employees per store. Salaries per employee remain the same. Download CFI’s sensitivity model template to test the numbers and calculate different scenarios on your own. Based on the model, the optimal number of employees (the independent variable) is 10 per store, in order to maximize profit (the dependent variable). The solution can be calculated using Excel’s solver function. Follow the screenshot below to check this solution on your own. Click on the Data Ribbon. Click on the Solver function. “Set Objective” to the profit cell (F10). “By changing variable cells” that contain the # of employees (C6). The result that’s displayed will be 10. You can also manually test this solution by changing the independent variable until you arrive at the solution above. Download CFI’s Excel template on Independent Variables. Thank you for reading this guide to understanding independent and dependent variables.